Brown Boronia - actually it is rather dark red which is a lot prettier than brown. An erect, compact shrub with simple, dark green leaves and brown cup-shaped hanging flowers which are sweetly scented. It has a strong heavenly perfume which has contributed to its popularity. 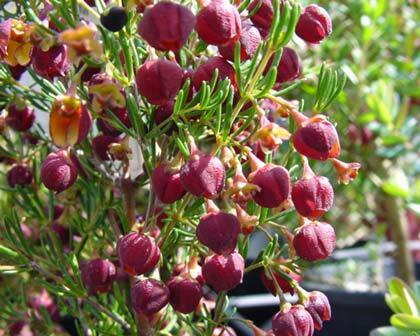 This boronia is more challenging to grow as it requires both excellent drainage and a cool moist root run. The Boronia is a popular cut flower in Australia. 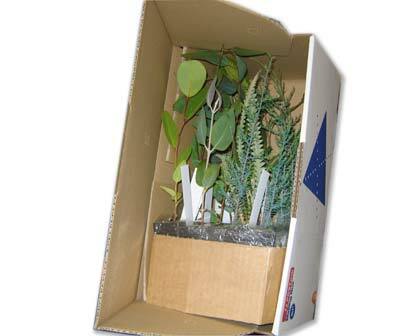 A sample selection of native plants at tubestock size - packed in a batch of 16 for secure post.